The Hispanic population in Texas is the second-largest in the nation. 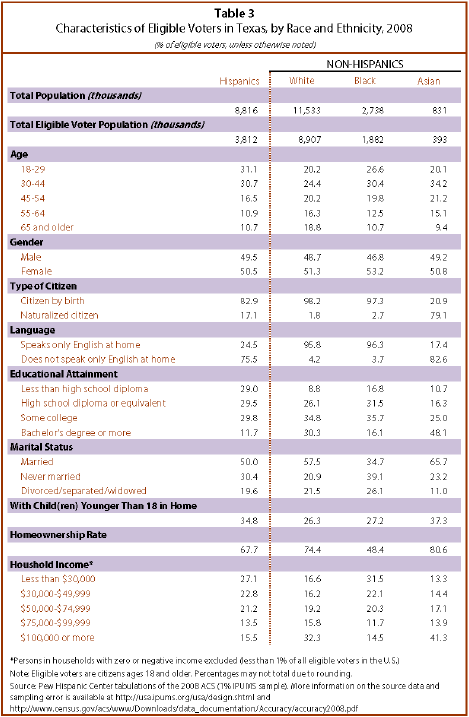 Some 8.8 million Hispanics reside in Texas, 19% of all Hispanics in the United States. 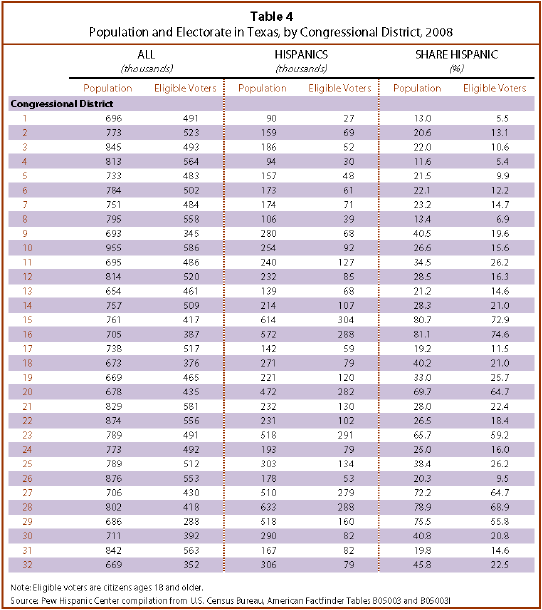 The population in Texas is 36% Hispanic, the 3rd-highest Hispanic population share nationally. There are 3.8 million eligible Hispanic voters in Texas—the second-largest Hispanic eligible-voter population nationally. California ranks first with 5.4 million. One-quarter (25%) of eligible voters in Texas are Latinos, the second-largest Hispanic eligible voter population share nationally. New Mexico ranks first with 38%. Some 43% of Latinos in Texas are eligible to vote, ranking Texas 21st nationwide in the share of the Hispanic population that is eligible to vote. In contrast, 77% of the state’s white population is eligible to vote. Age. Three-in-ten of Hispanic eligible voters in Texas (31%) are ages 18 to 29, equal to the share of all Latino eligible voters nationwide in that age range. 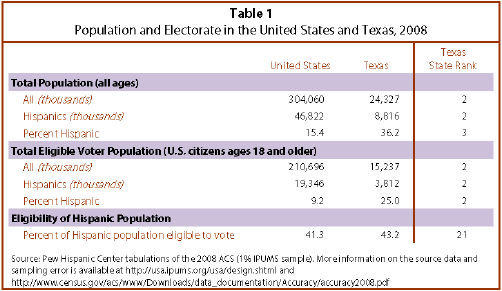 By contrast, only 24% of all Texas eligible voters and 22% of all U.S. eligible voters are ages 18 to 29. Citizenship. Some 17% of Hispanic eligible voters in Texas are naturalized U.S. citizens, compared with 8% of all Texas eligible voters. Hispanic eligible voters in Texas are more likely to be native-born citizens (83%) than are Hispanic eligible voters nationwide (74%). 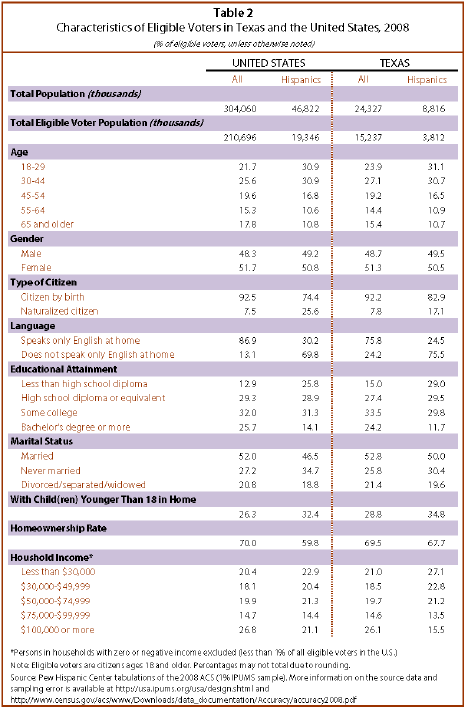 Educational Attainment. Three-in-ten of Latino eligible voters in Texas (29%) have not completed high school. That was greater than the rate for all Latino eligible voters—26%—and the rate for U.S. eligible voters nationwide—13%. Homeownership. Two-thirds of Hispanic eligible voters in Texas (68%) live in owner-occupied homes, compared with 60% of all Hispanic eligible voters nationwide. Similar shares of all eligible voters in Texas (70%) and all eligible voters nationwide (70%) live in owner-occupied homes. Number of Latino Eligible Voters. White eligible voters in Texas outnumber Hispanic eligible voters—8.9 million whites compared with 3.8 million Hispanics. Hispanic eligible voters outnumber black eligible voters in Texas by a margin of 2 to 1—3.8 million to 1.9 million. Age. Latino eligible voters are younger than other major racial groups in Texas. Three-in-ten of Latino eligible voters in Texas (31%) are ages 18 to 29 compared with 27% of black eligible voters and 20% of Asian and white eligible voters. Educational Attainment. Hispanic eligible voters have lower levels of education than do white and black eligible voters in Texas. More than three times as many Hispanic eligible voters compared with white eligible voters have not obtained at least a high school diploma—29% versus 9%. Homeownership. Hispanic eligible voters (68%) are more likely to live in owner-occupied homes than black eligible voters (48%), but they are less likely to do so than white eligible voters in Texas (74%).